Jan 21, 2009 - However, mutants carrying deletions in all three psd genes (psd1-3 mutants) ... of growth media with ethanolamine, which can be converted to. Apr 24, 2017 - the anoctamin (also known as transmembrane protein (TMEM) 16) and Xk-related (Xkr) .... blocked partially only at the highest concentration of 150 Î¼ g/ml (Fig. 4C). ... Another LPEAT2-directed shRNA also inhibited osteoclast. Aug 29, 2016 - interferon (IFN- ) was found to be a key component of the protective antibody ... degranulation (7) and gamma interferon (IFN-) production (4,. Jul 28, 2016 - Wolf, Robert Brink, Brigitta Stockinger. Corresponding author: Brigitta Stockinger, The Francis Crick Institute. Review timeline: Submission date:. Nitric Oxide Signaling in the Cardiovascular System. MYC. CCNA2. CCNE2 ..... (KPL). Recombinant SP-D served as standard and was included in the kit. The interstices of the mammalian stratum corneum contain lip- ids in a system of continuous membrane bilayers critical for the epidermal permeability barrier. Accordingly, GGA3 siRNA-mediated ablation impaired TBC1D3-induced macropinocytosis. We ..... Accordingly, all TBCID3-coding exons are identical in. Email: [email protected] Received: 23 November ... expressing the lacZ gene under the control of a NO-responsive promoter, we detected NO production in ..... About 500â1500 ng of RNA was used as a template for reverse transcription. Aug 14, 2018 - ... with recombinant mouse (rM)-CSF or recombinant granulocyte- ...... Nitric Oxide Signaling in the Cardiovascular System. MYC. CCNA2. JOURNAL OF BACTERIOLOGY, Dec. 2008, p. 8197–8203 0021-9193/08/$08.00⫹0 doi:10.1128/JB.01069-08 Copyright © 2008, American Society for Microbiology. All Rights Reserved. PC in the CE is compensated for by increasing the amounts of the other main zwitterionic phospholipid, PE. Although the membrane level of PC does not affect some key virulence traits of Brucella such as invasion, intracellular traffic, brucellosome formation, and intracellular replication, its presence is necessary directly or indirectly to sustain a chronic infection in mice (7). In view of the importance of the membrane lipid composition for Brucella pathogenesis, in the present work we analyzed PE biosynthesis in Brucella abortus and the role it plays in membrane function and virulence by disrupting the phosphatidylserine synthase gene (pssA), whose product is responsible for the first committed step in PE synthesis. MATERIALS AND METHODS Media and growth conditions. B. abortus strains were grown at 37°C on tryptic soy broth (TSB), tryptic soy agar (TSA), or Gerhardt-Wilson (GW) minimal medium (13) supplemented with 100 ␮M of choline dihydrogencitrate (SigmaAldrich Co.) when needed. Media were supplemented with the appropriate antibiotics at the following concentrations: kanamycin (Km), 50 ␮g ml⫺1; gentamicin (Gm), 5 ␮g ml⫺1; chloramphenicol (Cm), 20 ␮g ml⫺1; and ampicillin (Ap), 50 ␮g ml⫺1. For Escherichia coli strains, antibiotics were used at the following concentrations: Km, 50 ␮g ml⫺1; Gm, 20 ␮g ml⫺1; Cm, 20 ␮g ml⫺1; and Ap, 100 ␮g ml⫺1. Cloning, gene disruption, and generation of mutant strains. A DNA fragment of 847 bp containing the pssA gene of B. abortus 2308 (BAB1_0470) was amplified from genomic DNA using primers pssUP (5⬘-GCATAAGCCGATGGAAA CGCCT-3⬘) and pssDOWN (5⬘-TCAATTGTCACCGGACGAGGCT-3⬘) and Platinum Taq DNA polymerase (Invitrogen). The amplicon was ligated into pGemTeasy (Promega Corp.) to generate the intermediate vector pGemT-pssA. This vector was subsequently digested with NarI (New England Biolabs), blunted with T4 DNA polymerase (New England Biolabs), and ligated to a Km resistance cassette from pUC4K (24) to generate the plasmid pGemT-pssA::kan. This vector was introduced into B. abortus 2308 by electroporation to obtain the corresponding knockout mutant. Double recombination events (Kmr Aps) were selected, and the corresponding gene knockout was confirmed by genomic PCR. The strain was the B. abortus pssA mutant. To generate the pBBR4-pssA complementing plasmid, the pssA gene was excised from pGEMT-pssA by digestion with ApaI and PstI enzymes and subcloned into the pBBR4 replicative vector under control of the lac promoter. To perform the knock-in strategy, the pssA gene was excised from pGEMT-pssA by digestion with NotI and subcloned into a modified pBlueScriptKS-sacB/R vector (27). The resulting plasmid was introduced into the B. abortus pssA mutant by electroporation, and double recombination events were selected (Aps and sucrose resistance). Restoration of the pssA locus was confirmed by PCR and sequence analysis. The resulting strain was called the B. abortus pssA KI mutant. In vivo labeling of B. abortus with [14C]acetate and quantitative analysis of lipid extracts. The lipid compositions of B. abortus 2308, the mutant, and the complemented strains were determined by labeling with sodium [14C]acetate. The strains were grown overnight in GW medium, and the cultures were washed with GW minimal medium and used to inoculate 12 ml of GW minimal medium (with or without choline) at an optical density at 600 nm (OD600) of 0.1. After the addition of 2 ␮Ci of sodium [14C]acetate (56.50 mCi/mmol; New England Nuclear), cultures were incubated to an OD600 of 0.8. The cells were harvested by centrifugation. Lipids were extracted according to the method described previously by Bligh and Dyer (2) and separated by two-dimensional thin-layer chromatography (2D-TLC) on silica gel plates (Kieselgel 60; Merck) using chloroform-methanol-water (14:6:1) in the first phase followed by chloroformmethanol-acetic acid (13:5:2) in the second phase. After exposure to Biomax Kodak films, lipids were visualized by iodine staining. Spots corresponding to labeled lipids were scraped from the plate, and the radioactivity was quantified in a scintillation counter with 500 ␮l Eco-Lite scintillation liquid (ICN Biomedicals). Growth inhibition assay. Two Whatman filter discs (6-mm diameter) containing 15 ␮l of 1% (vol/vol) Sarkosyl (Sigma-Aldrich Co.), 1% (wt/vol) sodium dodecyl sulfate (Invitrogen Co.), or 1% (vol/vol) Zwittergent 3-16 (Sigma-Aldrich Co.) were placed on TSA plates seeded with the different Brucella strains. Plates were incubated for at least 48 h, and the diameter of the inhibition halo was quantified. J. BACTERIOL. PmB assay. The bactericidal effect of polymyxin B (PmB) was tested as follows. A total of 2.5 ⫻ 105 CFU of each strain were incubated for 60 min at 37°C with 0 (control), 10, or 30 ␮g ml⫺1 of PmB in 500 ␮l of 1 mM HEPES, pH 8 (Sigma-Aldrich Co.). Afterwards, serial dilutions were plated on TSA. The percent survival was calculated according to the CFU recovered from the control treatment. Plasmid swap. To demonstrate the essentiality of either pcs or pssA, we developed a plasmid swap experiment based on the instability of two vectors from the same incompatibility group in the same bacterial population. To this end, we first generated the strain B. abortus pcs::Gm pssA::kan(pBBR4-pcs) by disrupting pssA from a pcs mutant strain bearing a plasmid expressing pcs (pBBR4-pcs) (7). The resulting strain was able to synthesize PC but not PE and was resistant to Gm, Km, and Ap. We then introduced by conjugation the plasmid pBBR1 or pBBR1-pcs (encoding resistance to Cm) into this strain. Exconjugants were selected in TSA supplemented with Gm, Km, Ap, and Cm. Three independent clones from each conjugation were selected and cultivated for 20 generations in TSA with Km, Gm, and Cm. Two hundred colonies from each clone were replica plated in TSA with Km, Gm, and Ap and in TSA with Km, Gm, and Cm, and the percentage of chasing plasmid (Aps/Cmr clones ⫻ 100) was calculated. Cell culture infections. The HeLa and J774.A1 macrophage-like cell lines were maintained in Dulbecco modified Eagle medium and RPMI 1640, respectively, supplemented with 5% fetal bovine serum and streptomycin (50 ␮g ml⫺1)penicillin (50 U ml⫺1) in a 5% CO2 atmosphere at 37°C (all of those solutions and media were purchased from Gibco). Cells (5 ⫻ 104 per well) were seeded on 24-well plates in media without antibiotics and were kept for 24 h. B. abortus infections were carried out at the indicated multiplicity of infection (MOI). After 30 or 120 min (for J774.A1 or HeLa cells, respectively) wells were washed three times with phosphate-buffered saline (PBS) and incubated for 60 min with fresh medium containing 50 ␮g ml⫺1 Gm and 100 ␮g ml⫺1 streptomycin to kill noninternalized bacteria (afterwards, antibiotics were diluted to final concentrations of 10 ␮g ml⫺1 and 20 ␮g ml⫺1, respectively). At the indicated times, infected cells were washed three times with PBS and lysed with 500 ␮l 0.1% Triton X-100 (Sigma-Aldrich Co.). The intracellular CFU counts were determined by plating serial dilutions on TSA with the appropriated antibiotic. Antibodies and reagents. All the antibodies were diluted in 5% horse serum (Gibco) and 0.1% saponin (Sigma). The primary antibodies used were rabbit anti-Brucella polyclonal antibody (1:1,500), mouse immunoglobulin G anti-Oantigen monoclonal antibody (23), and mouse anti-human LAMP-1 H4A3 (Developmental Studies Hybridoma Bank, Department of Biological Sciences, University of Iowa). The secondary antibodies used were Alexa Fluor 488 goat anti-rabbit or anti-mouse and Alexa Fluor 568 goat anti-rabbit or anti-mouse (Molecular Probes, Invitrogen Co.). For DNA staining, Hoechst dye at 2 ␮g ml⫺1 (final concentration) was used. Fluorescence microscopy. Eukaryotic cells were plated on glass coverslips and infected as described above. At the indicated times the coverslips were washed with PBS, and the cells were fixed for 15 min with 3% paraformaldehyde and then blocked for 24 h with 1% horse serum–20 mM NH4Cl solution. After immunofluorescence staining, the coverslips were mounted onto slides with FluorSave (Calbiochem). Images were made and quantitation performed in a Nikon microscope (Eclipse E600) at a magnification of ⫻1,000, examining at least 100 cells containing bacteria from aleatory fields. Adobe Photoshop was used to merge the microscopic images taken with SPOT software (Diagnostic Instruments). Mouse infections. Eight-week-old female BALB/c mice were intraperitoneally inoculated with 1 ⫻ 105 CFU of B. abortus strains in PBS. At 2 and 8 weeks postinfection (p.i. ), spleens from infected mice were removed, weighed, and homogenized in 2 ml of PBS. Serial dilutions from individualized spleen were plated on TSA to quantify recovered CFU. FIG. 1. The B. abortus pssA mutant is not able to synthesizes PE. Total [14C]acetate-labeled lipids were extracted from GW cultures in the presence of choline and analyzed by 2D-TLC. Lipids spots corresponding to CL, PG, OL, PE, and PC are indicated. A dashed circle highlights the absence of a PE spot in the B. abortus pssA mutant. The relative percentage of lipids for each strain is represented in the graph. Data shown are means and standard deviations for triplicate samples. main zwitterionic phospholipid, PE, in the interaction with the host. In bacteria, the first step of PE synthesis is catalyzed by phosphatidylserine synthase (PssA) (15). Analysis of the Brucella genome sequences revealed the presence of orthologs of pssA from Sinorhizobium meliloti, a gene whose product is a CDP-diacylglycerol serine O-phosphatidyltransferase responsible for PE synthesis (29). The B. abortus 2308 gene BAB1_0470 (gi. 3788867) encodes a 278-amino-acid protein that shares 70% identity with the PssA from the related endosymbiont S. meliloti. The protein has eight putative transmembrane regions and belongs to subclass II of phosphatidylserine synthases (20). To determine whether the product of BAB1_0470 is implicated in PE biosynthesis, an insertion mutant in the corresponding locus was generated and named the B. abortus pssA mutant. The membrane lipid compositions of B. abortus 2308 (wild type), the B. abortus pssA mutant, and the complemented B. abortus pssA(pBBR4-pssA) and B. abortus pssA KI strains, grown in a defined medium in the presence of sodium [14C]acetate, were analyzed by 2D-TLC (Fig. 1, upper panel). It was observed that disruption of pssA abrogated PE synthesis, indicating that the phospholipid is formed via synthesis of the precursor phosphatidylserine by the action of PssA. Besides the absence of the spot corresponding to PE in the B. abortus pssA mutant, no other difference was observed between the wild type and the mutant strain. Synthesis of PE in the pssA mutant was recovered by knock-in or by ectopic expression of the wild-type copy of the gene, confirming that the product of BAB1_0470 is the phosphatidylserine synthase. The absence of PE was compensated for by increasing the amounts of the other zwitterionic lipid PC (37.6% versus 29.8%), OL (28.4% versus 18.1%), and the anionic CL/PG (34% versus 20%) (Fig. 1, lower panel). The B. abortus pssA mutant requires choline supplementation for growth. To analyze whether the absence of PE affects growth of B. abortus, the generation time in rich complex medium (TSB) or in defined medium (GW) was determined. FIG. 2. The B. abortus pssA mutant needs exogenous choline for growth. B. abortus 2308 and the B. abortus pssA mutant were grown in GW, in GW with 100 ␮M choline (Cho), or in GW with 50 mM MgCl2. At the indicated times, aliquots were taken to measure OD600. The pssA mutant was able to growth only when choline was added. FIG. 3. The B. abortus pssA mutant has defective intracellular survival. Kinetics of intracellular survival of the wild type, the B. abortus pssA mutant, and the complemented B. abortus pssA(pBBR4-pssA) and B. abortus pssA KI strains in J774A.1 macrophage-like cells (MOI, 50:1) (A) and HeLa cells (MOI, 500:1) (B) are shown. Intracellular bacterial CFU numbers were determined after lysis of infected cells as described in Materials and Methods. In both professional and nonprofessional phagocytic cells, the absence of PE severely affected the survival during the first 24 h p.i. Each determination was performed in duplicate, and values are the means ⫾ standard deviations from three independent experiments. FIG. 4. The absence of PE impairs trafficking in the host cell. (A to D) Representative epifluorescence micrographs of infected HeLa cells at 6 and 24 h p.i. (panels A/C and B/D, respectively). Infections were done with the wild type (A and B) or the pssA mutant strain (C and D), and HeLa cells were labeled for LAMP-1 (red) or Brucella (green) as described in Materials and Methods. Arrowheads indicate the bacterium and the surrounding area which is magnified (⫻3) in the insets. (E) Quantification of the LAMP-1 marker acquired by BCVs. Immunofluorescence stains of HeLa infections were made as described in Materials and Methods. The percentage (mean ⫾ standard deviation) of LAMP-1-positive BCVs is indicated for the wild type and the pssA mutant strain. ***, P ⬍ 0.001, Mann-Whitney test. defect of the B. abortus pssA mutant was concomitant with reduced splenomegaly, a hallmark of Brucella infection (data not shown). These results indicate that Brucella requires PE to achieve an efficient infection in the mammal host. FIG. 5. The B. abortus pssA mutant is defective for spleen colonization. BALB/c mice were inoculated intraperitoneally with the wild type, the pssA mutant, or the complemented knock-in (KI) strain as indicated in Materials and Methods. Individual spleen CFU values were plotted, and the horizontal bars represent the median CFU for each treatment group. *, P ⬍ 0.05 (compared to the group that received the wild-type strain), Kruskal-Wallis test. consequence of the high sensitivity to polycationic peptides and the traffic defects (Fig. 5). These findings, and our previous report showing that Brucella needs PC for full virulence (7), support the concept that membrane lipid composition plays an important role in the Brucella-host cell interaction. A likely explanation is that the lipid composition influences the structure or function of certain bacterial surface protein complexes needed to survive inside the cell. There are several reports describing how lipid composition influences the function or assembly of multiprotein complexes such as flagellum or secretion systems. In E. coli, PE is essential for the function of the electron transfer chain (21), for motility and chemotaxis (26), and for assembly and function of the lactose permease (3, 4). A PC-defective mutant of Agrobacterium tumefaciens has a loss of virulence due to reduced transcription of the VirB apparatus (33). In Legionella pneumophila, a mutant unable to form PC is avirulent, and this defect could be attributed to the loss of flagellin (10). The major virulence factor of Brucella is the type IV secretion system encoded by the virB operon, which is essential for the maturation of the BCV and the establishment of an ERderived vacuole where bacterial replication occurs (6, 28, 30). It was postulated that the Brucella VirB system delivers effectors to the host cell in order to control the fate of the BCV, but the nature of the putative effector(s) has not yet been identified. Given the reduced efficiency of the B. abortus pssA mutant in avoiding degradation in phagolysosomes and the establishment of the intracellular replicative vacuole, it is tempting to speculate that the membrane lipid composition could affect the assembly or function of the VirB machinery. To date, the lack of a model system to check the function of the Brucella VirB system precludes us from directly testing whether a link between the membrane lipid composition and the VirB apparatus exists. Independently of the molecular mechanism involved, the altered membrane properties, the defects in intracellular traffic, and the attenuated virulence in mice clearly indicate that the membrane lipid composition is critical for the virulence of Brucella. Further work is required to understand how phospholipids influence the Brucella-host cell interaction. ACKNOWLEDGMENTS This work was supported by grant PICT2005 38272 to D.J.C. from Agencia Nacional de Promocio ´n Cientifica y Tecnolo ´gica, ANPCyTSECyT, Buenos Aires, Argentina, and by grant PID-P5 72-5 to D.J.C. from Comisio ´n Nacional de Energía Ato ´mica, CNEA, Argentina. L.B. is a Ph.D. fellow and D.J.C., R.A.U., S.A., and D.D.M. are Career Investigators from Consejo Nacional de Investigaciones Científicas y Te´cnicas (CONICET, Argentina). D.D.M. is an international research scholar from the Howard Hughes Medical Institute. REFERENCES 1. Arellano-Reynoso, B., N. Lapaque, S. Salcedo, G. Briones, A. E. Ciocchini, R. Ugalde, E. Moreno, I. Moriyon, and J. P. Gorvel. 2005. Cyclic beta-1,2glucan is a Brucella virulence factor required for intracellular survival. Nat. Immunol. 6:618–625. 2. Bligh, E. G., and W. J. Dyer. 1959. A rapid method of total lipid extraction and purification. Can. J. Biochem. Physiol. 37:911–917. 3. Bogdanov, M., and W. Dowhan. 1995. Phosphatidylethanolamine is required for in vivo function of the membrane-associated lactose permease of Escherichia coli. J. Biol. Chem. 270:732–739. 4. Bogdanov, M., J. Sun, H. R. Kaback, and W. Dowhan. 1996. A phospholipid acts as a chaperone in assembly of a membrane transport protein. J. Biol. Chem. 271:11615–11618. 5. Celli, J., C. de Chastellier, D. M. Franchini, J. Pizarro-Cerda, E. Moreno, and J. P. Gorvel. 2003. Brucella evades macrophage killing via VirB-dependent sustained interactions with the endoplasmic reticulum. J. Exp. Med. 198:545–556. 6. Celli, J., S. P. Salcedo, and J. P. Gorvel. 2005. Brucella coopts the small GTPase Sar1 for intracellular replication. Proc. Natl. Acad. Sci. USA 102: 1673–1678. 7. Comerci, D. J., S. Altabe, D. de Mendoza, and R. A. Ugalde. 2006. Brucella abortus synthesizes phosphatidylcholine from choline provided by the host. J. Bacteriol. 188:1929–1934. 8. Comerci, D. J., M. J. Martinez-Lorenzo, R. Sieira, J. P. Gorvel, and R. A. Ugalde. 2001. Essential role of the VirB machinery in the maturation of the Brucella abortus-containing vacuole. Cell. Microbiol. 3:159–168. 9. Conde-Alvarez, R., M. J. Grillo, S. P. Salcedo, M. J. de Miguel, E. Fugier, J. P. Gorvel, I. Moriyon, and M. Iriarte. 2006. Synthesis of phosphatidylcholine, a typical eukaryotic phospholipid, is necessary for full virulence of the intracellular bacterial parasite Brucella abortus. Cell. Microbiol. 8:1322– 1335. 10. Conover, G. M., F. Martinez-Morales, M. I. Heidtman, Z. Q. Luo, M. Tang, C. Chen, O. Geiger, and R. R. Isberg. 2008. Phosphatidylcholine synthesis is required for optimal function of Legionella pneumophila virulence determinants. Cell. Microbiol. 10:514–528. 11. Corbel, M. J. 1997. Brucellosis: an overview. Emerg. Infect. Dis. 3:213–221. 12. DeChavigny, A., P. N. Heacock, and W. Dowhan. 1991. Sequence and inactivation of the pss gene of Escherichia coli. Phosphatidylethanolamine may not be essential for cell viability. J. Biol. Chem. 266:5323–5332. 13. Gerhardt, P. 1958. The nutrition of brucellae. Bacteriol. Rev. 22:81–98. 14. Gorvel, J. P., and E. Moreno. 2002. Brucella intracellular life: from invasion to intracellular replication. Vet. Microbiol. 90:281–297. 15. Kanfer, J., and E. P. Kennedy. 1964. Metabolism and function of bacterial lipids. II. Biosynthesis of phospholipids in Escherichia coli. J. Biol. Chem. 239:1720–1726. 16. Karnezis, T., H. C. Fisher, G. M. Neumann, B. A. Stone, and V. A. Stanisich. 2002. Cloning and characterization of the phosphatidylserine synthase gene of Agrobacterium sp. strain ATCC 31749 and effect of its inactivation on production of high-molecular-mass (133)-beta-D-glucan (curdlan). J. Bacteriol. 184:4114–4123. 17. Kent, C. 2005. Regulatory enzymes of phosphatidylcholine biosynthesis: a personal perspective. Biochim. Biophys. Acta 1733:53–66. 18. Lapaque, N., I. Moriyon, E. Moreno, and J. P. Gorvel. 2005. Brucella lipopolysaccharide acts as a virulence factor. Curr. Opin. Microbiol. 8:60–66. 19. Martinez-Morales, F., M. Schobert, I. M. Lopez-Lara, and O. Geiger. 2003. Pathways for phosphatidylcholine biosynthesis in bacteria. Microbiology 149: 3461–3471. Matsumoto, K. 1997. Phosphatidylserine synthase from bacteria. Biochim. Biophys. Acta 1348:214–227. Mileykovskaya, E. I., and W. Dowhan. 1993. Alterations in the electron transfer chain in mutant strains of Escherichia coli lacking phosphatidylethanolamine. J. Biol. Chem. 268:24824–24831. Minder, A. C., K. E. de Rudder, F. Narberhaus, H. M. Fischer, H. Hennecke, and O. Geiger. 2001. Phosphatidylcholine levels in Bradyrhizobium japonicum membranes are critical for an efficient symbiosis with the soybean host plant. Mol. Microbiol. 39:1186–1198. Nielsen, K. H., L. Kelly, D. Gall, P. Nicoletti, and W. Kelly. 1995. Improved competitive enzyme immunoassay for the diagnosis of bovine brucellosis. Vet. Immunol. Immunopathol. 46:285–291. Oka, A., H. Sugisaki, and M. Takanami. 1981. Nucleotide sequence of the kanamycin resistance transposon Tn903. J. Mol. Biol. 147:217–226. Pizarro-Cerda, J., S. Meresse, R. G. Parton, G. van der Goot, A. Sola-Landa, I. Lopez-Goni, E. Moreno, and J. P. Gorvel. 1998. Brucella abortus transits through the autophagic pathway and replicates in the endoplasmic reticulum of nonprofessional phagocytes. Infect. Immun. 66:5711–5724. Shi, W., M. Bogdanov, W. Dowhan, and D. R. Zusman. 1993. The pss and psd genes are required for motility and chemotaxis in Escherichia coli. J. Bacteriol. 175:7711–7714. Sieira, R., D. J. Comerci, L. I. Pietrasanta, and R. A. Ugalde. 2004. Integration host factor is involved in transcriptional regulation of the Brucella abortus virB operon. Mol. Microbiol. 54:808–822. Sieira, R., D. J. Comerci, D. O. Sanchez, and R. A. Ugalde. 2000. A homologue of an operon required for DNA transfer in Agrobacterium is required in Brucella abortus for virulence and intracellular multiplication. J. Bacteriol. 182:4849–4855. Sohlenkamp, C., K. E. de Rudder, and O. Geiger. 2004. Phosphatidylethanolamine is not essential for growth of Sinorhizobium meliloti on complex culture media. J. Bacteriol. 186:1667–1677. Starr, T., T. W. Ng, T. D. Wehrly, L. A. Knodler, and J. Celli. 2008. Brucella intracellular replication requires trafficking through the late endosomal/ lysosomal compartment. Traffic 9:678–694. Thiele, O. W., and W. Kehr. 1969. The “free” lipids of Brucella abortus Bang. Concerning the neutral lipids. Eur. J. Biochem. 9:167–175. Thiele, O. W., and G. Schwinn. 1973. The free lipids of Brucella melitensis and Bordetella pertussis. Eur. J. Biochem. 34:333–344. Wessel, M., S. Klusener, J. Godeke, C. Fritz, S. Hacker, and F. Narberhaus. 2006. Virulence of Agrobacterium tumefaciens requires phosphatidylcholine in the bacterial membrane. Mol. Microbiol. 62:906–915. 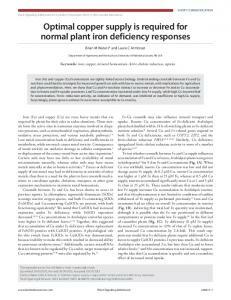 Report "Phosphatidylethanolamine Synthesis Is Required for Optimal ..."